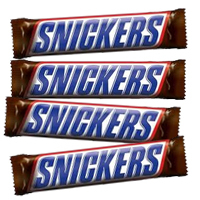 Snickers. (2 Bars each 51 gms).Deliver this delicious chocolate snack to your friends and relatives. Snickers. (4 Bars each 51 gms).Deliver this delicious chocolate snack to your friends and relatives. Snickers. (6 Bars each 51 gms).Deliver this delicious chocolate snack to your friends and relatives.